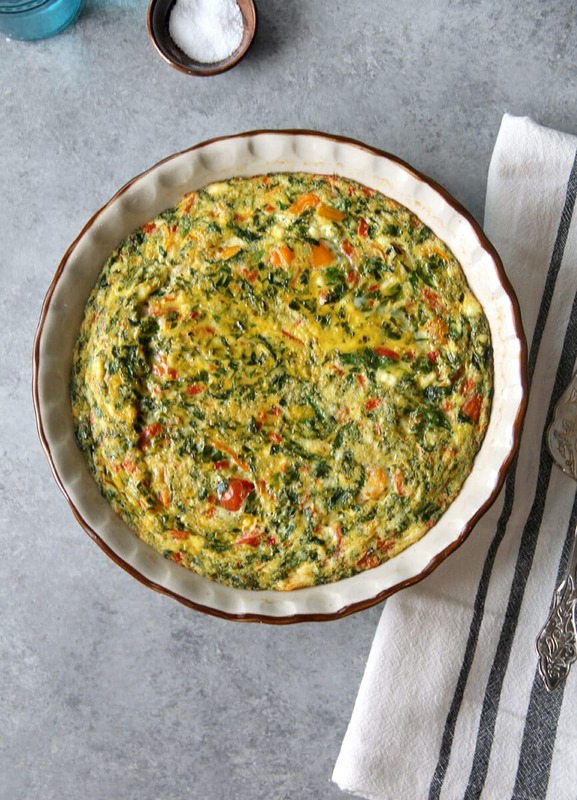 Easy crustless quiche recipe made with spinach, peppers, and onion—no cream and no flour. 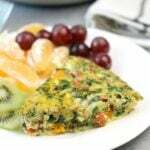 Add a little feta cheese and this is a healthy, simple meal for breakfast or a quick supper. But sometimes, I try to think about healthier alternatives to things like…pie crust. And cream. And butter. And cheese. And it turns out, the result doesn’t have to be flavorless cardboard. Wow. So simple, yet so hard to do in our over-saturated world of fast food and convenience products. And let me tell you, there are many days when I am perfectly happy to grab some fast food and you’ll find lots of convenience products used on this blog. I ain’t too good for that! But as David and I get older, we are embracing more and more the need to eat to live: what you eat is how you feel. So we’re actively trying to eat more vegetables, more fruit, less sugar, less meat. 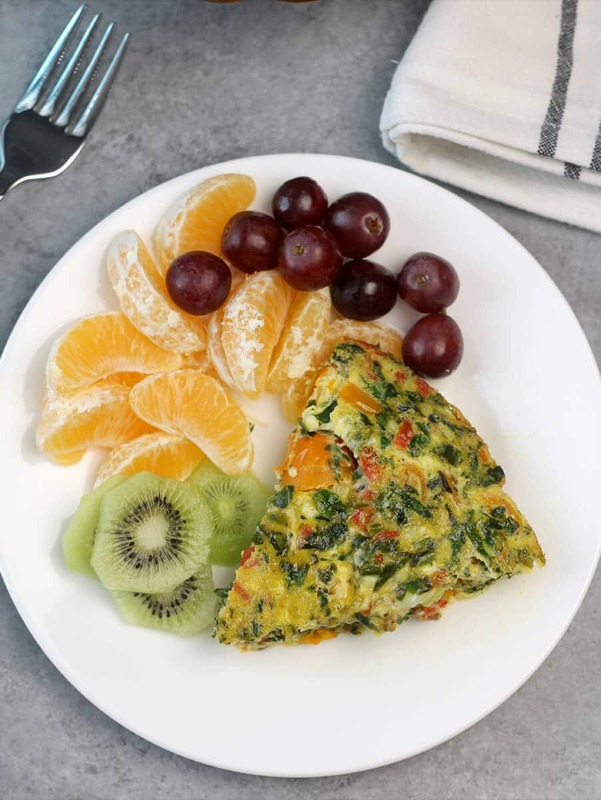 This Easy Crustless Quiche Recipe is one of our favorite ways to accomplish that goal: no meat, minimum dairy, loads of fresh, healthy vegetables, and protein-rich eggs. What I love about this crustless quiche is that it lends itself to almost any variation. You can add more cheese if you like and you can totally change up the vegetables—throw in some chopped broccoli or asparagus, or even zucchini. Basically use whatever you have on hand! It’s kind of a kitchen sink recipe, just throw in everything but the kitchen sink and call it good! And if you wanted to make this crustless quiche ahead of time, you could chop the vegetables and save them in the fridge until you’re ready to bake the quiche. But you can also go ahead and bake it and then save in the fridge. We eat on this quiche for several days, especially if it’s just the two of us. I haven’t frozen this quiche before, and I believe baked egg dishes tend to get a little rubbery after being frozen, so if you freeze it please let me know how it turns out. 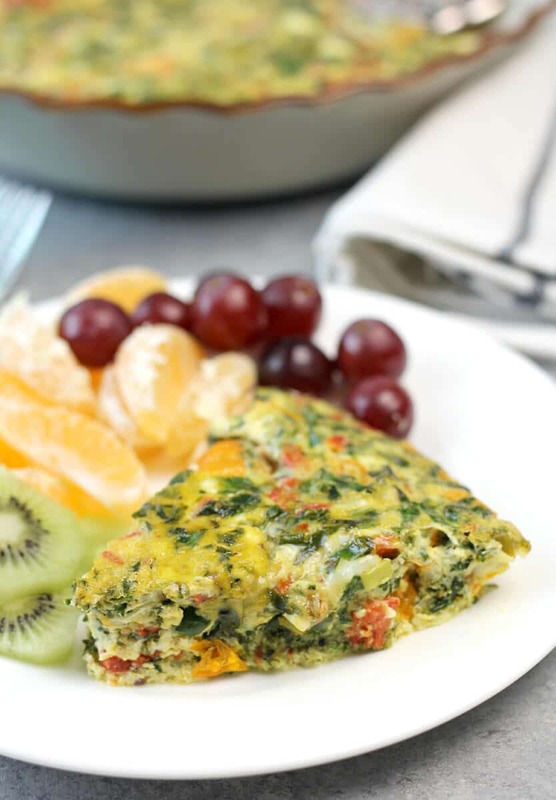 Quick and easy crustless quiche recipe made with fresh vegetables like spinach and peppers, with no cream and just a little feta cheese. It’s healthy and perfect for a quick breakfast or supper! Preheat oven to 375 and spray an ovenproof skillet with cooking spray. Saute peppers, scallions, parsley, and spinach until tender. Sprinkle with salt and pepper and stir. Add grape tomatoes and saute for about 1 minute. Whisk eggs and water in a bowl, then add feta, salt and pepper, and stir. Add to skillet and stir gently to mix. Bake 20-25 minutes until center is set. This quiche will keep in the refrigerator for a few days and heats up easily in the microwave. Hi Lucy, This looks delicious and it’s pretty to look at too! Here’s to a healthy new year!